Do you want to have the most accurate pistol on your block or at your pistol range? Then don’t look further. You won’t find anything as accurate for less than $1500-2000. I have seen retail prices on these as high as $1200 and you will see these for same typically in the $600 range. you can see in the picture, the grip is a sold walnut block to be customized to fit your hand like the proverbial glove! Even the two wood pieces that make up the grip are serialized to the handgun. In Europe these are called 5.6mm, their name for .22LR. These are frequently called Russian pistols, but these were made in the Soviet Union era. This one is a 1988. TOZ stands for Tulsky Oruzheiny Zavod which is the Russian name for the Tula factory as we know it. These are top quality handguns are made with surgical accuracy built into every detail. Each pistol comes in beautiful wood case with small spare parts, cleaning brushes and cleaning rod. This was graded as excellent but is likely brand new. Certainly wasn’t shot with these grips 🙂 I am selling this pistol for the price you see on the ones rated Good to Very Good which were likely used or have some condition issue, or perhaps missing parts. Comes with nice original fitted case. instruction booklet, cleaning rod and supplies, and spare parts. 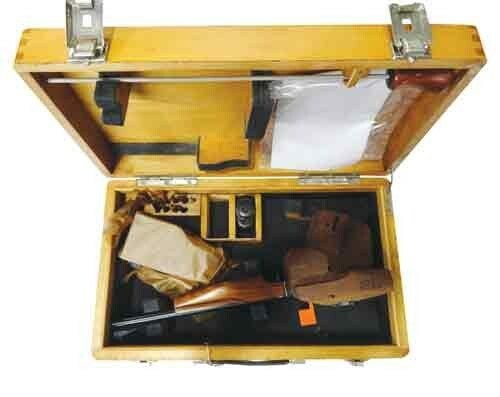 The parts kit, in their own fancy wood box, contain springs, front sights, firing pins, and parts needed for any potential maintenance or adjustment you may wish to make. As it is, the triggers on these require virtually no effort to fire….I have heard the trigger described as similar to a flea fart 🙂 It is that “light touch” that helps maintain the accuracy. These guys just don’t score you by the bullseye, but to the tenths of a bullseye or ring.